If you are a student of matric class and you cannot afford your expanses or want to help your family members then you can do online job to earn money. In this way you can earn money by doing part-time job online. In our country Pakistan unemployment rate is higher and more people want to do part time jobs so online job is one of the options for them. People have usually less knowledge about online jobs so in search of different online jobs they give up because they are unable to find online job. Here I would tell you about different ways to earn money online. When you start online jobs or business from your home or office and also with your studies its really easy and profitable. You can start its on maximum level after completion of studies just from one PC and from your home. It is sometime not easy to manage online job with your studies but there is competition everywhere so fittest survive. In online job you don’t need any huge investment and skills required for this kind of jobs .With just one PC and Internet Connection you can start it from your home and with proper working just 3 to 5 hours you earn much money to run your all expense and all other family expense too. There are many online jobs that require good language skills especially the article writing job. In matric class if you are not so efficient in language then I would suggest you other jobs such as data entry jobs. But if you have good language skills then nothing is difficult for you. There are a lot of opportunities available on internet to work online and lots of sites work on this kind of jobs. But please careful to choose work or projects from internet because of Scams companies. Best option to choose jobs on internet from well known sites. They have real and high paid jobs for all students of other people. One of the easiest online job options for matric students is data entry work and article writing. The easiest way to find an article writing job is through an employment agency. Some agencies specialize in jobs for students. Of course you can also respond to advertisements or search for a job on the Internet. Always make sure you know about the relevant formalities and rules before you begin to look for a job. There are a number of ways to earn or make money online without the fear of scammers or cyber crime. Following are the recommended examples and their explanation. YouTube is the world’s second most used website. YouTube provides online job opportunities to users. You can put any kind of videos on YouTube. Likes and clicks on your channel and videos will help you earn more money. You can put any kind of videos that you like, makeup tutorials, online teaching tutorials, advertising videos or daily vlogs. Once your channel has a specific number of subscriptions, YouTube will become a partner in your channel. People make a huge amount of money through YouTube. The key is being consistent in uploading videos and make quality content. You can earn money by creating your own blog. 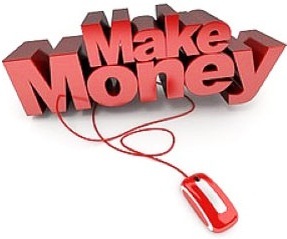 It is the most reliable way to earn money online. In past few years blogging gaining popularity among people as it is a reliable way to earn money online. The first steps of blogging are not very easy and blog takes some time to set up. But once it sets, you can earn loads of money. For blogging, first you have to set up your own blog free of cost. Many blogging sites are functional, like wordpress.com and blogspot.com. Then choose any topic of your liking like health, news, fashion, food, photography etc., and keep writing about it. When your blog gets optimum traffic, you can join online advertisement companies like Google AdSense, clickbooth.com, Media.net and start earning. Micro jobs are small tasks assigned to people by different websites. Micro tasks involve a variety of jobs, like dubbing, voice editing, freelancing, etc. These jobs are contract-based, the employer pays you as soon as the assignment completes. After completing the assignment, you can work with any other employer in a different niche. So you are not bound to a specific task. People earn up to 100 USD per assignment in micro jobs. Data entry jobs are very easy to comprehend. All you need is some free time, secure internet connection, and a computer. Data entry jobs include copy pasting the given data on specified websites. It does not have any registration fee so it is free home-based job. You can earn a lot of money by dedicating a few hours to this job. Through this job you can earn PKR 100/- per hour. And if your typing speed is high you can earn up to 120 USD (12000 PKR) per month. These jobs include writing different product reviews. It is a very popular job among students. And it is easy too. Companies offer a large sum of money for writing product reviews. This is an effective way of advertising products. This job requires good writing skills, a secure internet connection, and free time. If you have these qualities, this job is suitable for you. Product reviews can help you earn up to 200 USD per month. This job requires the employee to have incredibly fast typing skills. The faster you type, the more money you will earn. You will be given certain typing tasks and you have to type them as quickly as possible. This job is ideal for those people whose typing speed is fast. There are many online companies that are offering data entry or entry work to people around the world. These companies are very well-known internationally so there is no chance of scammers. If you can write well then this is the ideal job for you. People with apt writing skills can avail this job opportunity. There are many websites like freelancer.com and odesk.com which offer writing tasks for writers. All you have to do is to go on these websites and check out the work of your choice. These websites hire writers and assign them different tasks. Most of them require perfect grammar. So the writer should have command over grammar and English. Websites like Odesk.com hire web developers, graphic designers and Adobe Photoshop experts and assign them a number of tasks. Once they assign you a task, you have to complete it in a specified time and they give you your hard-earned money. This job requires hard work and dedication, but that is requirement of every single job. Freelancers can earn a huge sum of money per assignment. Networking jobs are the hype these days. They are free and do not need any registration fee. This job requires the employees to have known how of V-m ware 5.52, Oracle Linux Administration, Vaeem Backup. The job aspirants should know how to read, write and speak English. They also should have a Skype ID and a fast internet connection. Jobs offered on fiverr.com are also a type of Network Marketing jobs. Teaching is the most respectable of all professions. People with sound knowledge and good teaching skills can do this job. Many people seek online teachers for Quran, Islam, Mathematics, Physics, Chemistry, Biology, and Statistics. You will need a Skype or Viber ID, to communicate with your student. The salary is decided between the interested parties. Normally internationally residing Pakistanis seek online Islam, Quran and Tajweed teachers for their children, so it is a very good opportunity for many. Data entry job require excellent typing skills and strong mind. Capatcha entry jobs are actually data entry jobs. Data entry jobs are widely found on internet. Students having awesome and accurate fast typing speed can go for this job. You can find these kinds of jobs searching online and of course with the help of famous employment agencies. In need of a job, just done with first year. If there’s any Job available out there please let me know ..